This Safety Alert highlights the issue of chloride stress corrosion cracking of stainless steel Lokring pipe connectors and advises dutyholders on actions required. All the cracks found to date have been in unpainted stainless steel pipe connectors. However, the crevice in the connector (as shown above) presents a potential initiation site by localised corrosion, so painting may not guarantee elimination of the problem. Visual inspection and dye penetrant inspection can only find cracks that are surface breaking. Radiography has identified internal cracks that are not yet visible. Crack propagation and failure could therefore occur even where no cracks have been seen at the surface. 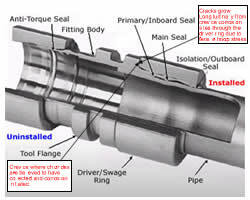 The driver ring is essential in maintaining the integrity of the connector. Cracking of this ring therefore presents a serious loss of containment risk. HSE research report RR902 Chloride stress corrosion cracking in austenitic stainless steel describes the process of chloride stress corrosion cracking in austenitic stainless steel and how to assess susceptibility to this degradation mechanism. 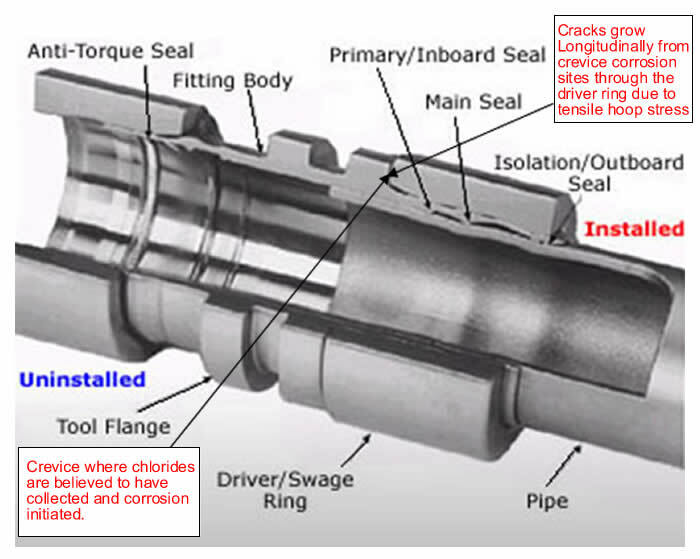 Dutyholders should identify where stainless steel Lokring connectors are in service in a chloride-containing environment, and remove from service where failure could present a safety risk. In order to reduce the risk in the most timely manner, the removal of connectors should be prioritised by the consequence of failure, time in service and most corrosive environment (eg temperature, presence of chlorides etc) as described in RR902. The Health and Safety at Work etc Act, 1974, Sections 2 and 3. Control of Major Accident Hazard Regulations, 1999, Regulation 4.